It seems that Dave Madden, now an assistant professor of English at the University of Alabama, was taking a course in nature writing when he became interested in museum dioramas and then taxidermy. Madden researched this book on taxidermy for five years and, as unlikely as the subject may at first seem, it is, in its own very odd way, a page turner. Madden structures his book around the life of Carl Akeley, often called the father of modern taxidermy and the man who created the Akeley African Wing at the New York Museum of Natural History. This wing, as millions of school children will remember, has the huge dioramas of elephants, rhinos and, other large mammals in their natural settings. The taxidermy goal here is to imitate the beast in life, to look realistic, even though the effect might last only a moment. Carl’s wife, Delia, was just as odd. Delia adopted a monkey, named it J.T., and took her home to their Manhattan apartment. Madden tells us J.T ate grapefruit at breakfast with a spoon and shaved Carl each morning with a straight razor. Believe it or not. After a while, this domesticity was shattered by a series of dangerous bites and J.T. sent to the Bronx zoo. 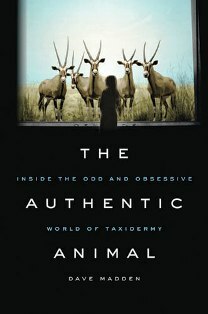 Madden, of course, writes at length about the history of taxidermy, how it is done, why it is done. Taxidermists traditionally learned their trade by correspondence courses, and the reader here might learn enough to start a hobby if so inclined. Readers learn, for example, that prepared skins are now arranged on forms, not stuffed with straw, that mounting pets is very different from mounting trophies and different still from museum mounting. We learn that few taxidermists hunt, but needless to say, the animals must be dead from some cause or other before preparation. Madden attends, in Reno, the World Taxidermy Championships which are just as intense as you might think. It is no small thing to have your mount declared Best in World. I was most amused, though, by the oddities, the novelty taxidermy. Taxidermists invented the jackalope, the jack rabbit with antlers. Better still is the Feejee Mermaid: the head and torso of a monkey sewn onto the lower body of a large salmon. There is also a group of squirrels playing dominoes, and there are groups of frogs drinking and smoking, and in one case wearing little berets and holding teeny automatic weapons. Madden, who is a trained literary critic, even mentions meta- taxidermy: a taxidermist frog in a chair “leaning over a hummingbird flayed open on a little table,” with little taxidermy tools lying around. Although the descriptions are intriguing, I really wish this book had photographs. Humans rarely preserve other humans, but there are exceptions. The model for Buffalo Bill in Silence of the Lambs is one. Another is Vladimir Lenin, whose body has been on display for eighty-five years. “Twice a week, Lenin gets rubbed with a mixture of glycerin and potassium acetate to keep his skin looking healthy,” Madden writes. Once a year he is given a complete overhaul.